The information received by the J-ALERT receiver can be automatically sent to registered e-mails, AreaMail, and emergency early warning e-mail. Not only manual delivery, but also automatic delivery of J-ALERT and weather information can be done with one single operation to 3 mobile carriers (NTT Docomo’s AreaMail, KDDI and SoftBank’s emergency early warning e-mail). 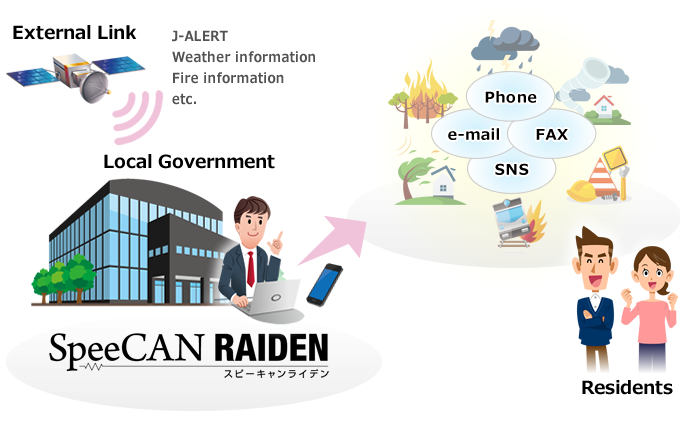 Information to be delivered can be automatically converted to a synthesized voice and broadcasted by disaster prevention administrative radio. Voice guidance can be used to deliver information for residents who do not use e-mails or living in regions where disaster prevention radio broadcasting are difficult to hear. The registered voice guidance message will be stored for 24 hour. Only 1 voice message (the latest one) is stored. Arcadia provides 1 telephone number to the municipal using this service. [Note] Telephone bill is not charged in case of using Arcadia’s designated phone number (050-####-####). The caller pays the telephone bill. Customizable to display information with CATV. [Note] In addition to this, it is also possible to collaborate with community FM and other companies’ systems.